Please listen as I make my official Ticket debut tomorrow at 9:30am on the Normathon! The show will go all day from 6 a. m. to midnight on Thursday, December 26th with all proceeds benefiting the Austin Street Center, the finest homeless facility perhaps in the entire country. 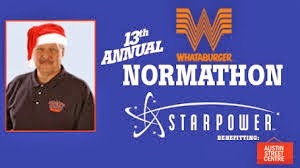 Here's a rundown of the ever-expanding list of people who'll be at Starpower Dec. 26 as LIVE and in-person guests during the 13th annual What-a-burger Norm-a-thon benefitting the Austin Street Centre for the Homeless. Be there as Norm does 18 consecutive hours on air with big, big name guests and major auction items throughout the show that you will not want to miss. You will want to stop by for terrific door prizes for those who show up at Starpower and contribute at the door. To date, Norm-a-thon has raised nearly $1.75 million in its 12 year history, including a record $235,000 last year. Make sure you are there with us for Norm-a-thon as we shatter last year's record mark!! A package of SIX professional one-hour massages from Dr. Rey Adorable of Advanced Wellness and Weight Loss Center at Preston Road and Belt Line. Dr. Adorable and his staff offer a wide variety of physical rehab programs while specializing in a weight loss approach that focuses on fat-burning hormones to help reduce inches, fat and cellulite with needle-less lipo. Dr. Rey has more than 25 years experience. Check out his company's website. A framed and signed photograph of perhaps the most memorable moment in DFW sports history. The winner of this prize gets an 8 X 10 picture of Nolan Ryan giving the Chicago's Robin Ventura a "noogie" during their fight on the mound in Arlington. This iconic photo is autographed by Ryan and provided to the Norm-a-thon by Gameday Connexion----your source for sports memorabilia, autographs, custom framing and athlete appearances. GC has locations in Grapevine Mills Mall, Ridgmar Mall and Northeast Mall. Check out their incredible array of items by going to their website here. Winners will be drawn at 11:30 p.m. the night of Dec. 26 at Starpower. You do not have to be present to win. The Ticket's promotions department will notify winners and inform them how to claim their prizes.